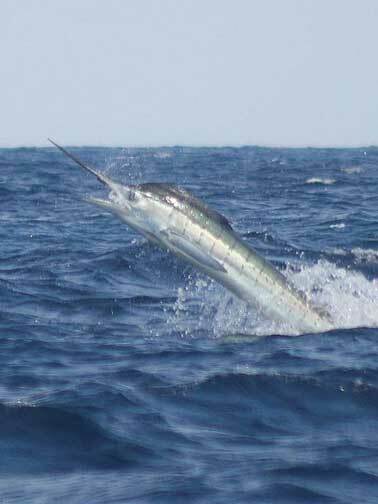 Simply the best Marlin fishing in the world! 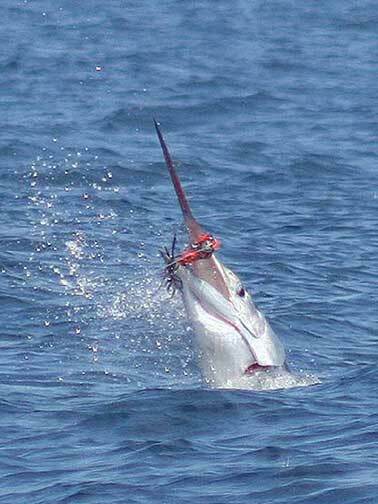 Striped Marlin 150lbs + (average 200lbs), Blue Marlin 300lbs+, and Black Marlin 350lbs+ (500-800lbs not uncommon). Multiple strikes are not uncommon. 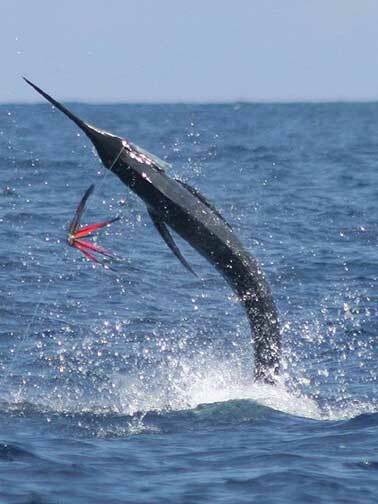 All of the marlin are abundant and most are super sized. 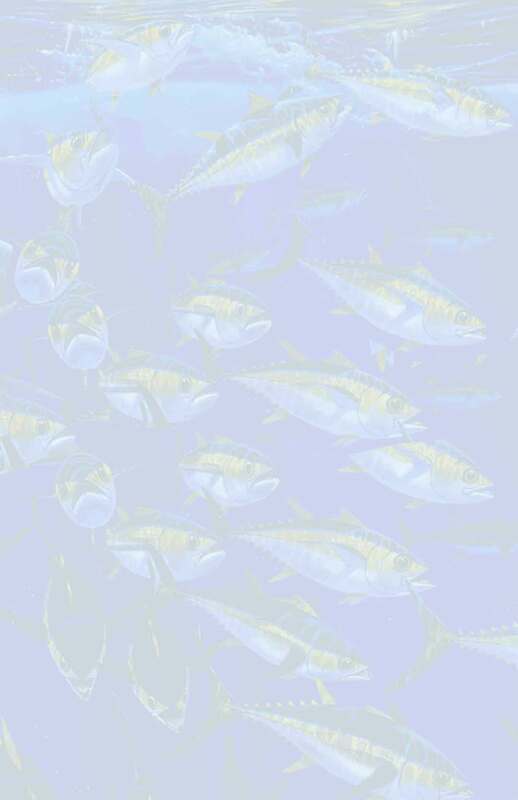 There is virtually no fishing pressure because of the distance from the mainland and strict environmental controls and diligent conservation. Thousands of porpoises (dolphins) and sea birds (including albatrosses and frigates) frequently give away the location of feeding fish. 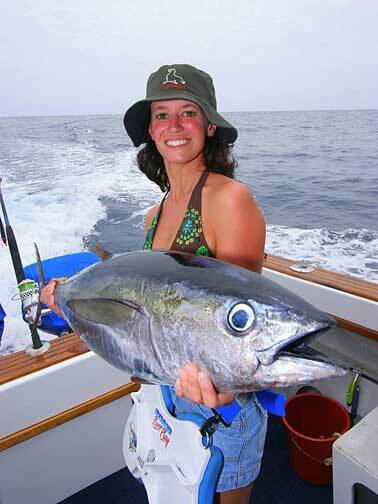 Yellowfin tuna from small school size to 150lbs+, wahoo, jacks, mahi, and other fish are also found in incredible quantities. 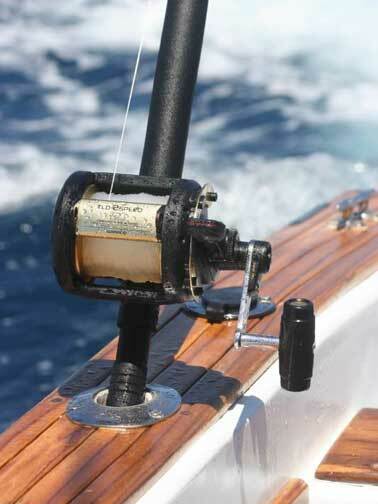 Stand-up 50lb class gear loaded with 80lb mono are a a must for the marlin. Multiple hookups are not uncommon, and the added line strength gives the angler a chance to exert additional pressure when the boat is unable to chase their fish. This gear is provided on the charter boats. 30lb conventional outfits are suitable for trolling tuna, wahoo, mahi, and big jacks. Big Shimano Stradic or Spheros spinning reels loaded with 30-50lb braided line (Berkley Fireline or Spiderwire) on matching 7' Shimano Trevala spinning rods are perfect for casting big lures to breaking fish. The Trevala rods are capable of muscling even some of the biggest fish. Butterfly jigging is deadly using either Shimano Torsa or Torium reels loaded with 50-80lb Berkley Spiderwire and Shimano Trevala rods rated for 50-100lb line and jig weights from 110-200gm. Belts Braid Power Play belts and harnesses are a must. There are simply too many big fish to fight with a belt alone without getting tired. Multiple hook-ups are not uncommon. It is tradition to sign and leave at least one belt behind from your group. The belt will remain on display at Rosita's Restaurant until you return. This way anglers get to leave a bit of themselves behind to make up for all the magical experiences they take away. Gloves A quality pair of Blue Fever Long Range gloves is a must. The gloves will protect your hands from screaming lines and the blistering sun. 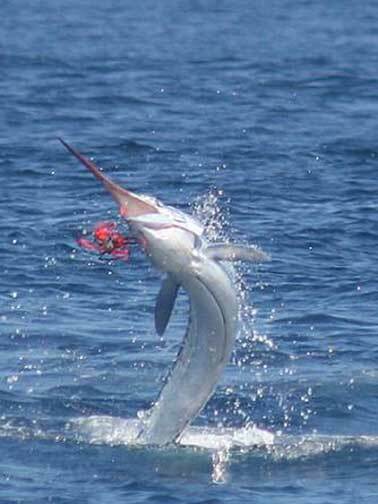 It will also allow the angler a chance at a great photo-op when releasing the fish at boat-side. A second pair of release gloves is needed if the angler wants to get involved wiring their own fish. Be careful, these fish are big and very dangerous at boat-side. 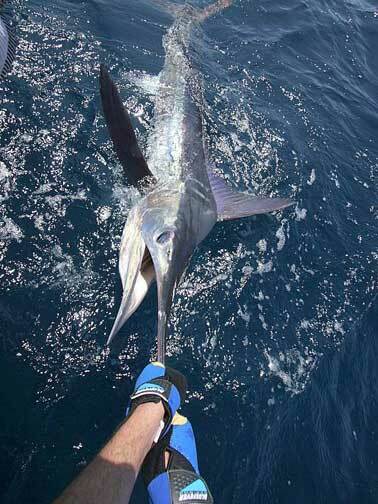 Leaders 400lb Yo-Zuri Disappearing Pink Fluorocarbon leaders are the norm for marlin. These are provided by the boat. The leaders are attached to 200lb SPRO ball bearing swivels with coastlock style snaps. 30lb outfits used for trolling tuna, wahoo, mahi, etc. should have a length of double line attached to a 130-200lb Yo-Zuri Disappearing Pink fluorocarbon leader completed with a 200lb SPRO ball bearing snap swivel. Butterfly jig and spinning outfits should incorporate an 80lb Yo-Zuri Disappearing pink fluorocarbon leader which can either be tied directly to the jig or lure or by using a small snap swivel. Lures The most effective lures in recent years have been the largest Iland Lures especially the Iland Express. This big 10 1/2" lure can be fished alone or with a rigged ballyhoo. The darker colors saw much of the action, but on certain days other lighter color combinations were more effective. All the bigger lures are typically rigged with short lengths of wire with very little loss in effectiveness. 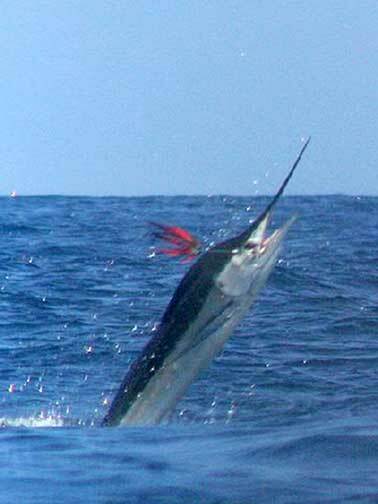 The smaller Iland Lure sizes were incredibly effective for trolling tuna, mahi, and wahoo. Some of the daisy chains also worked very well including the feathers, squid, and bird chains from Olde Salt Tackle. For casting to busting Tuna, big Yo-Zuri Surface Cruisers and Hydro Pencils are the ticket. A good selection of both light and dark colors is needed. The 8" (3 1/2oz) Surface Cruiser was best. Hydro Pencils only come in one size. Shimano Butterfly Jigs in every color are deadly, sometimes the drift and current can be quite fast and a good selection of "regular" jigs from 110-160gms is needed.